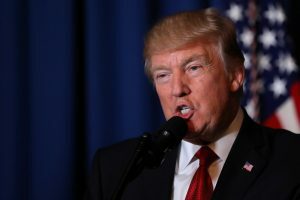 PALM BEACH, Fla. — The United States is vowing to keep up the pressure on Syria after the intense nighttime wave of missile strikes from U.S. ships, despite the prospect of escalating Russian ill will that could further inflame one of the world’s most vexing conflicts. At the United Nations on Friday, Russia’s deputy ambassador, Vladimir Safronkov, strongly criticized what he called the U.S. “flagrant violation of international law and an act of aggression” whose “consequences for regional and international security could be extremely serious.” He called the Assad government a main force against terrorism and said it deserved the presumption of innocence in the chemical weapons attack. Trump spoke by telephone Friday with Saudi Arabia’s King Salman, who reaffirmed strong support for the military strike and thanked the U.S. president for his “courageous” action, according to statements issued Saturday by the White House and the official Saudi Press Agency. The Turkish foreign minister, whose country is a strong backer of the Syrian opposition, said the U.S. missile strikes were not enough. Mevlut Cavusoglu said Saturday that the U.S. intervention was only “cosmetic” unless it removes Assad from power. He said the most ideal process would be a political solution that leads to a transitional government. Thursday night’s strikes — some 60 cruise missiles fired from two ships in the Mediterranean — were the culmination of a rapid, three-day transformation for Trump, who has long opposed deeper U.S. involvement in Syria’s civil war. Advisers said he was outraged by heartbreaking images of young children who were among the dozens killed in the chemical attack. In a letter to Congress on Saturday, Trump said he “acted in the vital national security and foreign policy interests of the United States, pursuant to my constitutional authority to conduct foreign relations” and as commander in chief and chief executive. Still, the impact of the strikes was unclear. Despite intense international pressure, Assad has clung to power since a civil war broke out in his country six years ago, helped by financial and military support from both Russia and Iran. Russian military personnel and aircraft are embedded with Syria’s, and Iranian troops and paramilitary forces are also on the ground helping Assad fight the array of opposition groups hoping to topple him.